Discover your steppingstone to a beautiful lifestyle! Let the natural beauty of Springmoor inspire a beautiful retirement lifestyle. Continue your career, pursue a heartfelt interest or simply relax where a wealth of amenities and services offers boundless opportunities. You will also appreciate the value of Springmoor, Raleigh’s premier Life Care Retirement Community, where you can enjoy life to the fullest knowing that you are supported by a full continuum of on-site healthcare services. Call 919-651-4844 today, or complete the short form on this page to receive your FREE information packet. 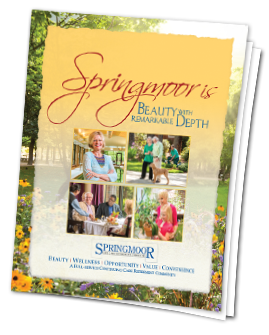 Request your FREE Springmoor information packet! ©2018 Springmoor Life Care Retirement Community. All Rights Reserved.